1. How can we be sure we won't be risking our business's reputation? This is the first, and most important, consideration for most businesses; while all good businesses want to see lots of positive comments they also welcome constructive criticism, but we are all well-aware of the damage a negative review can do, especially to a high-value service business such as wealth management, recruitment or estate agency. Put simply: a review criticising the colour of a pair of shoes is relatively harmless (potential customers will 'read through it') but a review - malicious or not - unfairly attacking a business's core values is potentially extremely harmful, in both the short and long term. 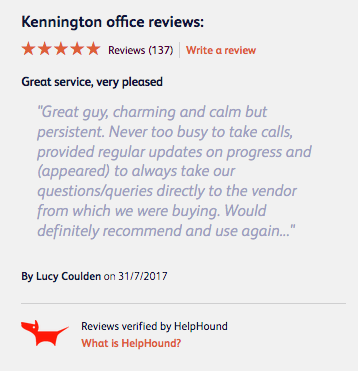 There are two aspects of HelpHound's service that our clients - and their customers - find reassuring: the first is Resolution™, our mechanism that serves potentially misleading or inaccurate reviews to the business pre-publication. We estimate that this enables businesses to manage over 95% of such reviews, including nigh-on 100% of identifiably malicious or fake reviews by competitors and disgruntled ex-customers and staff (it happens!) - and is equally welcomed by consumers - they don't want to make fools of themselves, on your website or on Google. 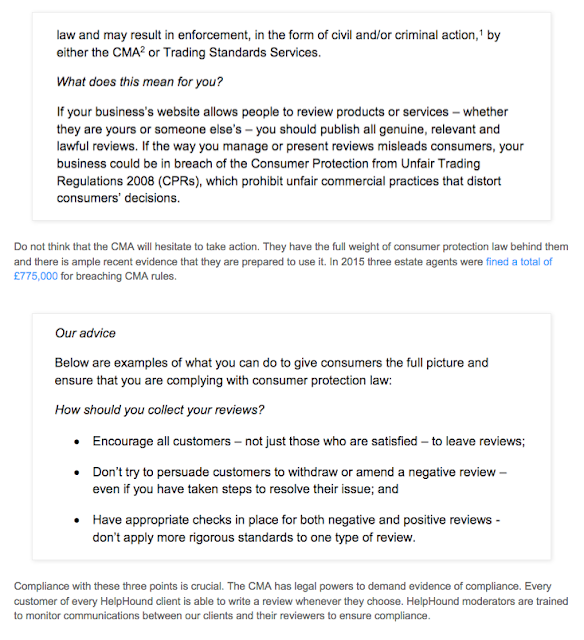 The second is our appeals service: if a business has a pre-existing review on a public platform (Google or TripAdvisor, for example) that potentially contravenes the platform's terms and conditions - or violates common law - we will provide professional advice on how best to appeal it. Put simply: HelpHound is by far the safest way to engage with reviews. 2. Why shouldn't we just use an independent review site? Which one? And, just as importantly, will it still be the right choice in five years' time? ownership: why add value for an independent review site when you should be owning your own customers' reviews yourself (data is money in the bank nowadays)? If an independent review site is part of the solution for our clients, rest assured that we will recommend it, as we do with Facebook for nearly all of our clients and TripAdvisor and some of the other influential OTAs for our clients in hospitality. Put simply: professional review management has all of the advantages of an independent review site but none of the disadvantages. You can always invite testimonials to your own website, they are a universally recognised marketing tool, but 'reviews' (legally defined as being verified by a third-party) are so much more powerful, because they carry so much more credibility with consumers. You can invite reviews directly to an external site - Google or TripAdvisor or Yelp or any other 'open' reviews site, but to comply with the law you must invite all your customers. So many businesses have managed to look next to perfect on Google by hand-picking happy customers (let's face it, if a business cannot find twenty of those it will be struggling anyway, but 200+?) without realising that what they have done is in contravention of the CMA regulations - and they have the force of law. Put simply: why deny your business the benefits of professional review management to save £tens a month? 4. What is it going to cost - in time and training as well as cash? Straight answer? From £60 a month (for up to 100 customers) - scaling upwards dependent on traffic - hotels, for instance, are £1 a room per month. There are volume discounts for multiple branches/locations. We will provide you with all the training and support, both initial and ongoing, that you will need to make a success of your membership. Bear in mind that an unsuccessful member is the worst kind of advertisement for HelpHound and we're determined that won't happen. Put simply: we want you to succeed, and we will make every effort to make sure you do. 5. Are there any guarantees? If we don't pay for ourselves within six months of your business joining - and it's our fault (in other words: you've done as we suggest) we will refund you every penny. 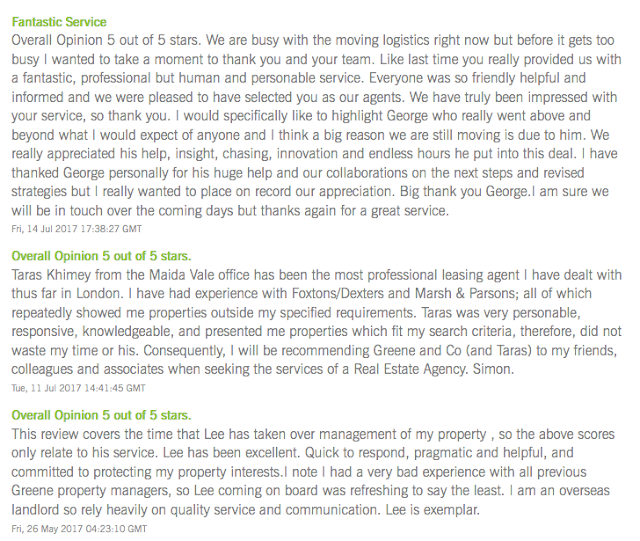 You only have to look at our existing clients to see their success stories - see 'Further reading' below - and please speak to them too. One of our main 'guarantees' is the fact that we don't insist on a contract at outset (unlike many independent review sites!) - we want you to prove HelpHound works for your business without any ties. Put simply: join now, you have nothing to lose. Businesses join HelpHound so they can demonstrate their prowess and professionalism to potential customers in what has now been proven beyond doubt to be one of the most effective drivers of new business there is: effective and professional review management. It's nice to look good in search; it's nice to look great - in the eyes of your own customers - on your website; it boosts staff morale if they see compliments in writing, and that also aids recruitment, but it's great to do more business as a direct result of all those factors combined! the rules - the CMA regulations - do you comply?